In a Merged PDF template, you combine multiple PDFs into a single document. This feature goes beyond dynamic PDFs, allowing you to combine separate PDFs into a single document. Any of the segments may contain wildcards that merge data values from your form. This feature is used for generating complex documents like mortgages or leases. 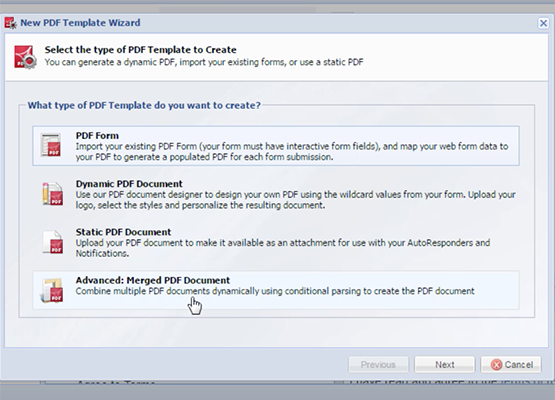 Choose Advanced: Merged PDF Document and click Next to move forward in the wizard. Click Next to move to Generated PDF Document Settings. The default for Update Option is false. Change to true if you want to regenerate the PDF each time the record is updated. This can cause some performance decrease, which may be significant for high-volume processing. You should also select true if you are testing and troubleshooting. In the PDF Field, choose Create new PDF Form Field or Use Existing PDF Field. Depending on your choice, enter a name for the hidden field on your form that will be created to contain the filename of the PDF, or if you have already created a hidden field to hold the PDF, choose it from the dropdown list that appears. This is where you select the PDF documents to combine into the final output. You can use PDF's generated for the current form or lookup PDF's generated on another form using a lookup rule. Each segment is combined into the final output. Click Add to add a . In the Merged PDF Segments Settings window that appears, choose "Use Local PDF", to use a PDF generated (or associated with) the current form, or "Lookup from alternate Form", to lookup a PDF from another form, and click Next. Enter a Segment Name that will clearly distinguish this document segment from any others you plan to add. PDF Attachment From the drop-down list, choose the PDF for this segment. Encrypted or password-protected PDFs cannot be used as segments in a merged document. Pages Enter the number of pages from the segment that you want to include in the final merged document. The default is all. You can enter a single page number (5), a range (2-4), or a comma-separated list of pages (1, 2, 5). Edit Rule Optional, if you want to apply a rule that will govern the processing of this segment, click to open the rule editor and apply one or more filters. Finish Click to commit this segment as part of the merged document. Lookup Table Click and select the form with an associated PDF that you need from the dropdown list. PDF Attachment choose the PDF from the dropdown list. Edit Lookup Rule Click to define the rule that will govern the use of this PDF. Repeat, adding as many segments as required. You can select a segment and Edit or Delete it. You can also change the order using the Up and Down menu items. Click Finish to commit the changes. In a moment, the new merged template will appear in the PDF Population Templates management window. These values will be replaced with their respective page number and total pages in the final generated document. Combine Conditional Content, Inline Conditions and this Merged PDF functionality to create a wide range of PDF documents with a high level of customization.